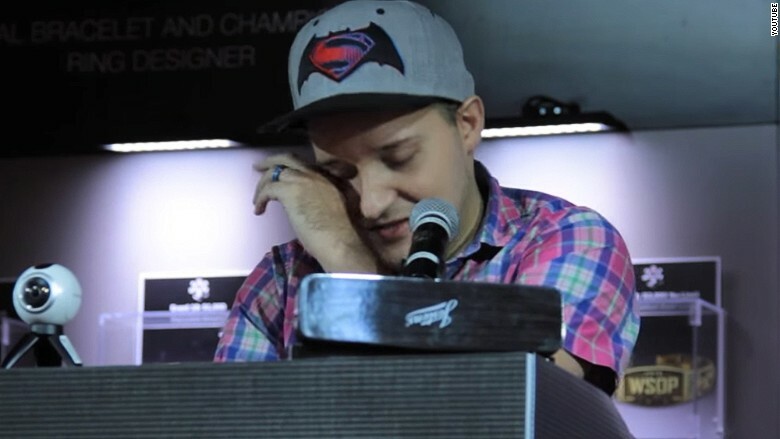 Poker pro Ryan Laplante didn't expect to give a speech on Sunday when he accepted his gold bracelet for winning a major tournament -- but the mass shooting in Orlando changed his mind. Laplante, 26, took the stage with his fiancé Chris Katona by his side and teared up as he spoke. "I am so proud to call myself a World Series of Poker champion. I'm proud to call myself an openly gay man. I encourage all of you to be proud of who you are." Laplante won more than $190,000 in the pot-limit Omaha event, one of dozens of games that make up the annual World Series of Poker at the Rio casino in Las Vegas. Laplante grew up in a small town in Minnesota and said he didn't have many role models who were gay growing up. He came out after high school. "I just wanted to be completely open," and the poker community has always been very accepting, he said. Laplante said that he felt compelled to speak following the shooting in Orlando that was "so sad, so shocking, so terrible" and which targeted the gay community. He said the U.S. has made considerable progress, but that there's still much more that needs to be done to foster acceptance of everyone. By itself, he said, poker doesn't add anything to the world. But when you win a bracelet, "you get to have a moment." He takes that responsibility seriously: "As a poker player, that's the only way I'm going to have a positive impact."